Interest rates for ordinary savers held up pretty well after the first Fed rate cut in July last year. There was a simple reason--banks needed the money. With the credit squeeze making it tough for banks to raise cash, the last thing they wanted was for savers to draw their money out in search of higher returns. The Fed's efforts to relieve the squeeze have been somewhat successful--banks have substantially cut the rates they'll pay savers. The first graph shows the Effective Fed Funds Rate (blue) versus the rate that I've been earning on my ING Direct savings account (red). (I picked the ING rate simply because it's one that I happened to have data for. The Fed Funds and mortgage rate data are from the St. Louis Federal Reserve.) As you can see, the savings account rate held steady for a couple of months after the Fed Funds began to drop, and even after it began to fall, fell more slowly. The rates actually crossed over in December, with the Fed Funds rate falling below the savings account rate. 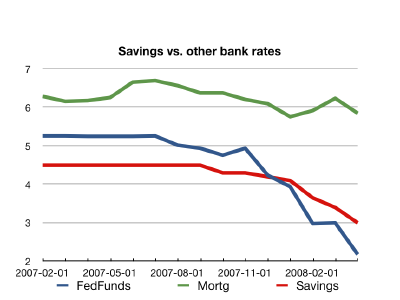 Still, with the Fed driving rates lower and lower, the rate paid to savers dropped steadily. The 4.5% that ING was paying last summer has fallen to 3%. As an aside, it's worth noting that the rates that bank charge have scarcely dropped at all. The green line tracks the average rate for a 30-year conventional mortgage, which has barely budged over the past year. Given this, what's a saver to do? Well, shopping around for better rates is always worth doing. There are banks paying more than ING Direct. It's also worth considering other savings instruments. As an example of the latter, consider savings bonds, and in particular, the I Bond. It pays a complex variable rate based on the Consumer Price Index. Some people dismiss it, knowing that the CPI substantially understates inflation. That's a mistake. Instead of comparing the I Bond to the inflation rate, you need to compare it to other rates available to savers. The way the I Bond works, there's a fixed rate to which is added an inflation rate (basically, the CPI). The fixed part doesn't change once you buy your bond; for the rest of this month, it's going to be 1.2%. The inflation rate changes every six months, based on the CPI for the preceding six months. We know what the combined rate is for the rest of this month: 4.28%. If you buy a bond this month, you'll keep the same 1.2% fixed rate for the lifetime of the bond. We also know that the growth in the CPI for the past six months will almost certainly be as high as the growth in the preceding six months, so you can be reasonably confident of getting as good a rate for the next six months as you're getting for the first month. After that, rates will vary--but I don't think you need to worry about the rate of growth in the CPI dropping so low as to make an I Bond uncompetitive with an ordinary CD or savings account any time soon. So, how do I Bonds stack up compared to CDs or savings accounts? Well, one big difference is that you can't get your money back for a year. Once a year has passed, you can cash your bond in any time you want, but if you cash it in before 5 years are up, you lose 3 months interest. Taking that penalty into account, an I Bond is roughly as good as a 1-year CD that pays 3¼%. The big win for I Bonds comes when you really don't know how soon you might need the money. You have to be confident that you won't need the money for a year, but after that you can decide month-to-month whether the I Bond is the best choice. If those months add up to 5 years, the 3-month interest rate penalty goes away and the bond just gets better. Because you don't know the future (regarding either interest rates or your future needs for money), one thing to consider with savings bonds is buying them in small amounts over time. You can buy an I Bond for as little as $50 ($25 if you buy them electronically via TreasuryDirect). That makes it easy to manage the one-year wait before you can cash a bond in--buy very modest amounts at first. If the interest rate remains competitive, buy more later. Savings bonds pay interest from the first of the month, no matter when in the month you buy them. So, by buying them near the end of the month, you can pick up almost one month's interest immediately. If you're struggling to find a reasonable return for your savings, and you've got some money that you can safely tie up for a year--especially if there's a pretty good chance that you won't need it for another five years--the I Bond is a reasonable choice. It's quite a bit better than most bank CDs. I have been trying off and on to buy savings bonds for weeks. For some reason, the Treasury Direct site wanted more confirmation of who I was from a bank official before I could buy electronic I bonds (why? I have no clue), and I wanted to send a paper EE bond to my baby nephew. It turns out that, great as my local credit union is, they said they are not allowed to be involved with savings bonds, and so far I haven't found a local bank that will help me as a non-account holder, so both projects are in limbo. So if you belong to a CU rather than a bank, allow yourself extra time, as the new bond rates are set in May and November. You know I've seen this happen with my ING account too. In my savings it went up to 3.057% on March 11th, and then on March 19th went down to 2.960%. At first I thought I was being penalized for transferring money out of my savings account, but this actually makes me feel better about that thought. So forget Cd's and money markets, you can get that single digit ROI in a few minutes of trading. First, it's just wrong to say that you can't get rich saving--not only is it possible, it's practically inevitable if you do it long enough. It's closer to true to say "No one got rich in a hurry by saving," but even that isn't really true--if you live very frugally while earning a good income, you can put aside enough money to get rich in a hurry, without needing huge investment returns. The fact is, people get rich by saving all the time, you just mostly don't notice them, because there's no easy way to tell that they're rich. Second, the whole notion presupposes that "getting rich" is an important goal. Getting rich has its upside, but "Living large on a small budget" can happen without getting rich--at least, without needing to get rich in a hurry. It addresses the issue you raise, in the context of making your investment portfolio meet your goals. There IS a war on savers and productive people.